I recently tweeted a link to an article about Twitter that advocated a tactic of building a Twitter following by following people and hoping they follow back. 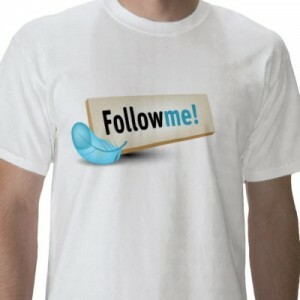 A local business owner asked me if the "find, follow, and hope for followback" strategy actually works. It was a great question… one that takes a few more than 140 characters. First it's a tactic, not a strategy…which I say not to be smart alec, but rather to impress the need to know your overall marketing strategy first, and then choose your tactics. Once you know your goals, objectives and target audience, then you can choose a tactic that will help you achieve those goals and objectives. If you've just started your Twitter profile and have no followers, before you ask the question "who?" first ask "what?" Ask yourself what you need to Tweet about that will make your target audience WANT to follow you. Get busy…even if you have no followers, yet…and start posting those tweets. When you follow someone and they wonder who you are, they'll check out your profile. You'll only have one chance to make a good first impression. So make sure that your profile is visually designed to communicate your brand identity, and filled out with a bio that describes your value proposition, and links to your site (or a page in your site that would be a compelling landing page for people coming from Twitter). But even more important, you want them to see a list of your recent Tweets. If there are a bunch and they're authentic, transparent, interesting, compelling and of value, they're more likely to follow you back. So how do you choose who to follow hoping they'll follow you back? I always have my clients start first with the media echo chamber. Traditional media hasn't died yet, and still has influence. Getting a local media outlet to follow you increases your chance of getting press coverage. I created a list of local media on Twitter for my clients in Milwaukee, and we look through the list and have them follow those outlets that give them the greatest chance of interest. To find a media list, simply do a search for media outlet you know by name in your community on twitter, and look for the "listed" link on their profile. You'll find a bunch of lists with other media outlets. Pick and choose strategically to follow the ones consistent with your brand and your target demographics. Next find local influencers. For instance, if you're a Wine Shop, identify and follow the people who tweet about wine and wine tasting events. Don't just follow, REALLY follow. See what they're tweeting about, and who they're engaging in conversations with. Follow those people too. Is there a wine tasting or food event? See who's talking it up in advance. Follow them. The day of the event, if there's a hashtag, see who's tweeting the hashtag. Follow them. But that still isn't enough to assure that you'll get follow backs. Begin to engage them. You're the expert, right? Ask them their opinions. Share information with them. Make recommendations. The relationship that develops will create its own network. Continue to extend that network by watching the followers of those in that network. Follow them. Engage. Expand. Repeat. If you think all you need to do is start a Twitter profile, and follow millions of people hoping for follow backs, you'll not only fail to get meaningful results, but you're missing the point of Twitter entirely. Social Media is about relationships. And that takes more effort than just a click of a "follow" button.